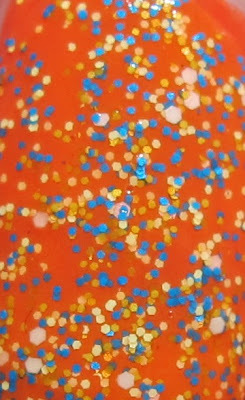 Today's post is Nail-Venturous Lacquers Orange You Unique? Orange You Unique? is a clear base packed with matte neon blue, yellow, orange, and white glitter. I layered two coats of Orange You Unique? over one coat of OPI Call Me Gwen-ever. I like this combo, but I don't love it. I think Call Me Gwen-ever was TOO orange. I wanted more of a yellow-y orange for my base. I really love these matte glitter polishes! I wish more mainstream companies would use matte glitter. This is a really fun polish and it makes me super happy to look at it! I know Amy from Nail-Venturous Lacquers is taking a long break from making and selling her creations, but I do hope she comes back relatively soon. I still want Sunny Floam and Humble Bee. You can find Amy's Etsy shop here. It's "on vacation" right now, but keep an eye out! Remember, there's still time to enter my Nicole by OPI giveaway!! OPI Call Me Gwen-ever was sent for review. For more information, please read my Disclosure Policy. this is a tropical party for the nails! Thanks Marsidia! Do you have any Nail-Venturous polishes? Peace, Love and Polish- me too! Do you have this one or is it on your list? Crystal- exactly! Like a luau!